Ever since I was a child, I have gotten a thrill when I see a ship, a large one. 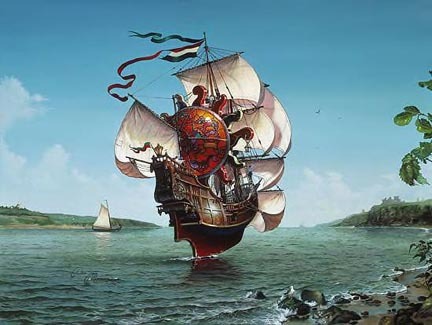 I have been on boats before, small sail boats - not really meant to hold more then 10-12 people (that is the closest I have come to being on a true sailing ship) and I felt completely at home on them. I don't get sea sick, I love the sun, I have a terrible sense of balance on dry land, so why not add the shifting of waves to it all! Being on a boat, on the ocean, it fills me with a sense of calm, of freedom, adventure, peace and wild joy. It fills me with a sense of home. I loved it, and immediately started researching artists. It took me close to a year to find an artist I truly loved. 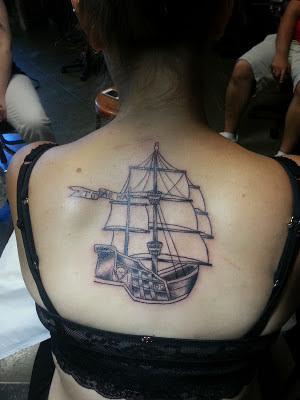 I wanted a clean style, creativity (I wanted the artist to use the base drawing and make the picture his own, without losing the magic of it) I wanted it to have a bit of a sketch feel, almost like a slate or even charcoal drawing, be done completely in black ink and be a good size so it took up a large portion of my upper back. I chose to put my girls initials on the flag and to make the "pirate" aspect of it more subtle, no blatant flag. 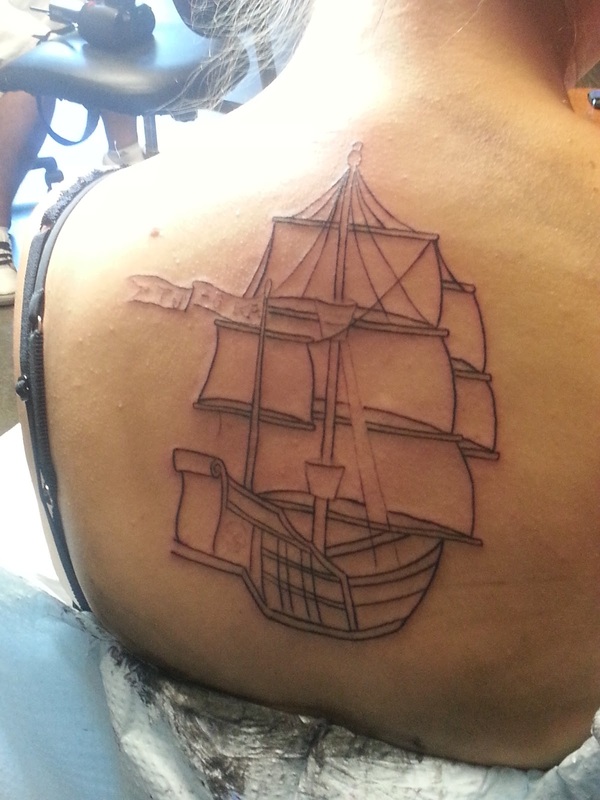 So I had the drawing, I had my ideas - all that was left was to make the appointment and get the tattoo...and I started getting a little scared. I knew I could handle pain, after all, I have had three children with no medication. I can handle pain! But actually paying someone to do that to me went against my human nature. So I decided to go back a few steps and start a little smaller. 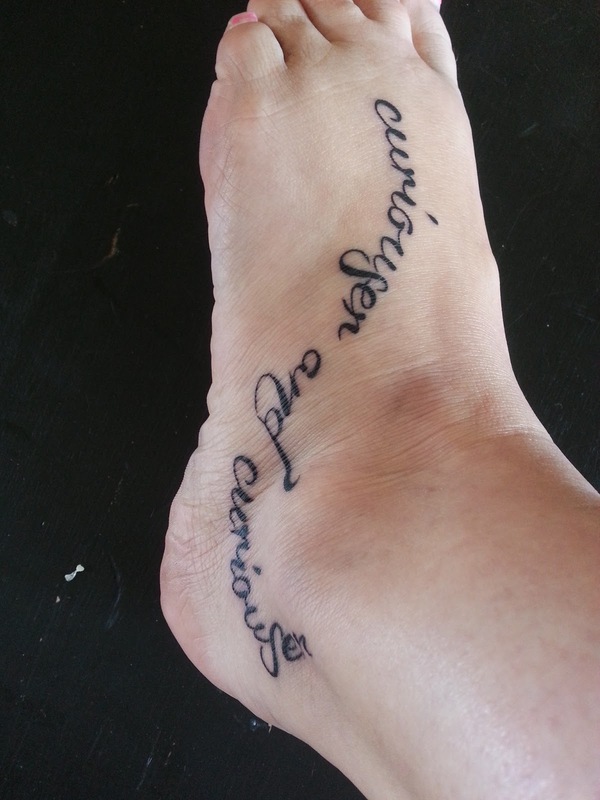 Not the most flattering angle for a foot I know, but I wanted to get all of the words in the picture. After that tattoo was done, I started to get excited for the next one. I had handled the pain just fine. (Aside from an almost fainting spell that I am saying was a lack of lunch that day...once I ate something I was just fine. I did not faint, no matter what the tattoo artist may tell you!) I gave them my picture, we talked through it all and made our appointments. 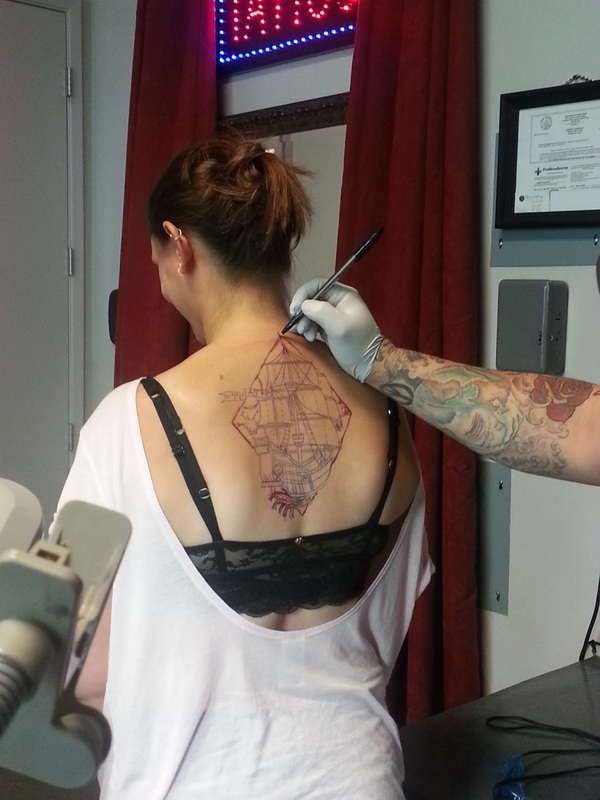 I wish I had gotten some pictures of the sketches the artist did as we decided on the final picture, it took some time to get it where I wanted - but finally we got started! By that time I was technically 31, but no one is really counting right? I was very pleased with how it was turning out. 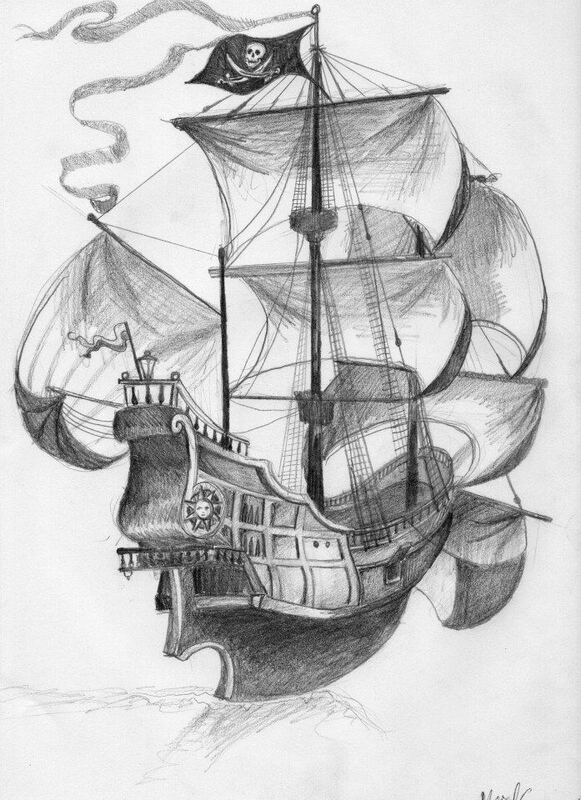 He had changed it to look a little more like a real ship, and less like a children's book illustration. Which was good, I wanted it to be all it's own and not just copied. 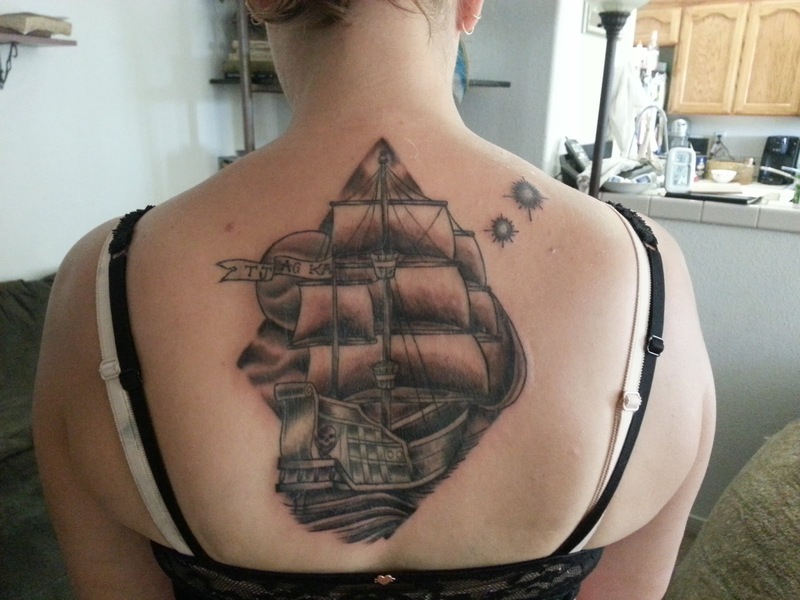 About a month and a half went by between sessions, and I finally got it finished this last weekend! 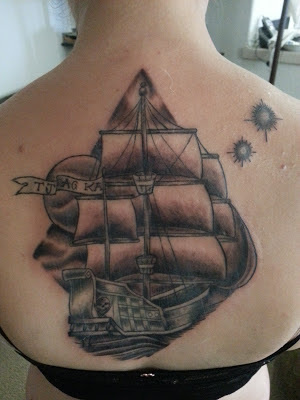 The second session took another 3 hours, but was well worth it in the end. My finished Pirate Ship Tattoo! I am VERY well pleased with the final product. It is exactly what I had in mind, and it is now very fun to look back on the journey and be nothing but proud. As you can see, I couldn't resist adding the "Second star to the right" so Peter Pan is represented. As of right now, I do not plan on getting any more tattoo's. Though I hear they are highly addictive and almost no one stops at two. So we shall see - I have been asked several times WHY on earth I would ever want a tattoo - and perhaps that is a post for another time. But I think it is simply a part of my story. I have always wanted it, and in a weird sort of way it makes me feel more complete. Like I have been walking around without hair for most of my life and I finally realized what I was missing. We, as humans all have a story. We all dress/talk/behave in a way that broadcasts our stories in one way, shape or form. There is a part of us that we want known, that we need understood right away. Some people tell their story by wearing loud jewelry, or fancy shoes. Trendy clothes or a cute, styled hair-cut can answer a lot of questions about a person in seconds flat. It shows what they value, what they want to represent. Who they want to be. Some people you will never, not in a million years, ever see without make-up and/or hair done. That is the part of their story they want seen. Perhaps it is protection against fear of rejection or a shield against getting too close, too real. Either way, it answers questions in seconds. It helps life to be a little bit easier. Some people always have dirt under their fingernails, paint on their arms, glue on their hands or oil and grease on their clothes. That is their delight, that is how they wear their stories. You know a part of who they are instantly without ever having to ask. Before they even begin to speak. For those of you that know me, you know I don't do things half way. I am not always an easy person to be around. I have faults, I have scars. I am rough around the edges. I rarely say what is right or proper in any given situation, but I am loyal and will fight for what I believe in. I have an unquenchable sense of laughter, adventure and more then a little bit of stubbornness. I am a writer, I am a storyteller. I am a wife and mother. I am a rebel, I am pirate, just ask my kids. I am a sailor, and now I have a ship! This is my story. I am proud of my story. The process of getting to where I am now often hurt, it was rarely easy and I don't expect it ever really will be. But the story is MINE. And there is joy in the journey. This - life, stories. This is my art.